© Arrivi et al. ; Licensee Bentham Open. Slow coronary flow phenomenon (SCFP) is characterized by angiographically normal coronary arteries with delayed run-off of contrast medium across the vasculature. Its etiology and clinical significance are still not completely known; however, acute congestive heart failure (CHF) is rare in this context. A 71 year-old woman with SCFP presented with acute CHF complicated by ventricular tachycardia. Treated with rosuvastatin (20 mg/day for 6 days) and inotropic drug infusion she had a complete recovery of left ventricular function and normalization of serum levels of the high-sensitivity C-reactive protein (hs-CRP), which were increased (3.6 mg/L) during the acute phase. This case illustrates that the anti-inflammatory properties of rosuvastatin may deserve specific clinical tests not only during the chronic phase but also in the acute phase of CHF patients. Keywords: Rosuvastatin, acute heart failure, slow coronary flow..
A 71-year-old woman presented to the emergency department for a syncopal episode occurring early in the morning and followed by shortness of breath and persistent hypotension. Her past medical history included high blood pressure (BP), a previous transient ischemic attack, and paroxysmal atrial fibrillation treated with propafenone. On examination she had a BP of 85/50 mmHg, sinus bradycardia (pulse rate of 51 b/min) with new onset left-bundle-branch block (LBBB). Transthoracic echocardiography showed impaired left ventricular (LV) systolic function and an ejection fraction (EF) of 30%. 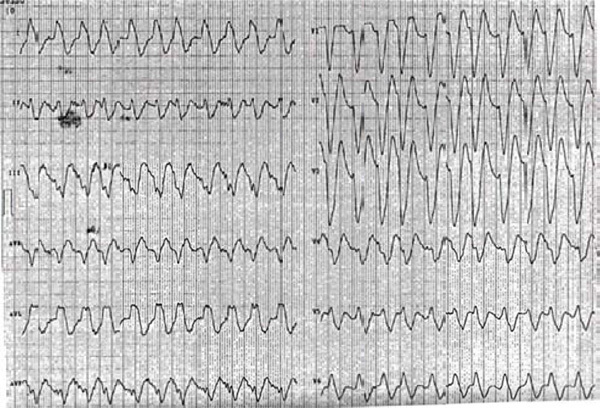 During hospitalization she had several episodes of non-sustained ventricular tachycardia Fig. (1). Slow progression of the contrast medium in the distal tract of the left anterior descending coronary artery (arrow). 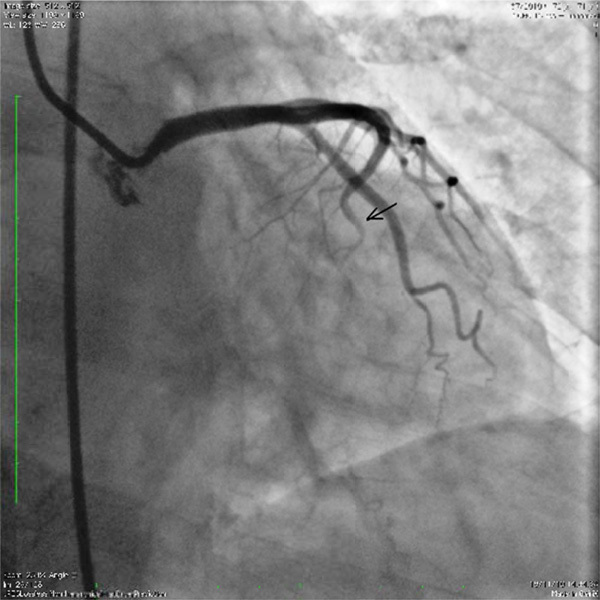 Injection of contrast medium in the left coronary artery showing trapping and staunching (the stemming of the contrast me-dium flow). 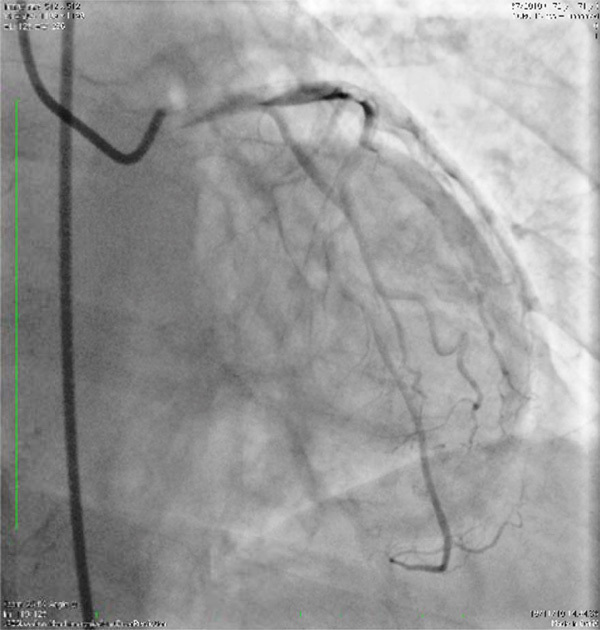 Injection in the right coronary artery showing slow empty-ing of the epicardial segments. 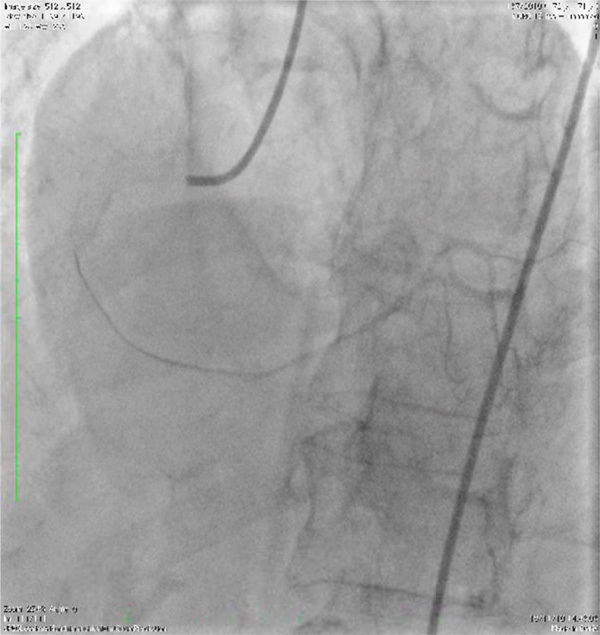 Coronary angiography in multiple orthogonal views clearly showed slow coronary flow phenomenon (SCFP) with slow progression and trapping, staunching (the stemming of the contrast medium flow), and back and forth motion both in left and right coronary arteries Figs. (2-4). TIMI flow was grade 3 and corrected TIMI frame counts were 32, 28 and 26 for left anterior descending, left circumflex and right coronary arteries, respectively. The creatine kinase MB (CK-MB) and troponin I levels were normal both at admission and during the following days. Biochemical analysis including serum electrolytes, and complete blood count were also normal. Serum levels of the high-sensitivity C-reactive protein (hs-CRP) were 3.6 mg/L. Immediately after coronary angiography, dopamine and dobutamine infusions at incremental doses were promptly started. Aspirin (325 mg iv loading dose followed by 100 mg/day), enalapril 5 mg bid, and rosuvastatin (20 mg/day) were also given. Infusion of inotropic agents was gradually decreased starting at day 3, until the complete stabilization of the hemodynamic parameters. The clinical course was uneventful and the patient was discharged with rosuvastatin 20 md/day after six days from acute event with serum levels of hs-CRP 0.6 mg/L. At 1 month follow-up, echocardiographic LV function normalized with EF 55%. LBBB disappeared after 1 week. Holter ECG monitoring performed at 1 month did not show any significant ventricular arrhythmias and the patient remained asymptomatic and with unchanged hs-CRP levels up to 6 months follow-up. A repeat angiography was not performed. The SCFP was first described in 1972 by Tambe et al. in 6 patients with chest pain and was attributed to the abnormally high small-vessel resistance . Opherk et al. and Mangieri et al. performed right and left ventricular biopsy studies in patients with SCFP, demonstrating structural changes on small intramyocardial vessels in the form of “small-vessel disease”, not visualized by coronary angiography [2,3]. Moreover, Mangieri et al. showed a functional obstruction of microvessels, specifically vessels < 200 μm, as the behaviour of abnormal coronary vessels was relieved by dipyridamole infusion but not by intracoronary nitroglycerin injection . On the other hand, Beltrame et al. reported the presence of increased resting coronary vasomotor tone in patients with SCFP . Studies by myocardial perfusion scintigraphy showed reversible perfusion abnormalities in these cases [5,6]. More recently, Atak et al. reported an increase of QT dispersion on the surface electrocardiogram in patients with SCFP , raising the concern regarding the association of this phenomenon with the risk for ventricular arrhythmias and sudden death [7-9]. Our case shows SCFP associated with ventricular arrhythmias and transient acute CHF treated by inotropic drugs, whereas only rosuvastatin was used long-term in addition to standard therapy with ACE inhibitors. It is possible that clinical improvement was due to the effects of rosuvastatin on microvascular perfusion with accompanying electrophysiological properties on cardiac muscle. Endothelial dysfunction, coronary flow reserve (CFR) and coronary microvascular reactivity can be improved using statins [10,11]. There is substantial evidence that these beneficial effects of statins on coronary microvascular function result from endothelial nitric-oxide activation . In addition, it was suggested that improvement of myocardial vascular function by statins may result from reduction in plasma lipid fractions although other actions on blood vessels may exist (pleiotropic effects) . Short-term studies both with simvastatin  and atorvastatin  in patients with SCFP free of overt narrowing of epicardial coronary arteries showed an improvement in CFR. We submit that similar effects on endothelial function may follow rosuvastatin administration. It has previously been reported that chronic CHF with activation of oxidative stress, proinflammatory cytokines, endothelial dysfunction, and neurohormone activation might be ameliorated by statin treatment . The Controlled Rosuvastatin Multinational Trial in Heart Failure (CORONA) randomized 5011 patients with systolic heart failure to placebo or to rosuvastatin 10 mg/day. It was suggested that rosuvastatin reduced the risk of cardiovascular death, myocardial infarction, stroke or worsening of heart failure, and decreased the number of hospitalizations for cardiovascular reasons, particularly in patients with abnormal hs-CRP [17,18]. This benefit was also confirmed in a study by Kjekshus et al. . Notably, despite the absence of clinical effect on mortality, rosuvastatin was associated with substantial and sustained biological effects in both CORONA and Gruppo Italiano per lo Studio della Sopravvivenza nell'Insufficienza Cardiaca (GISSI-HF) trials, consisting of relevant decreases of blood LDL cholesterol and inflammatory parameters . Instead only a treatment with n-3 polyunsaturated fatty acids (PUFA) 1 g daily provided a beneficial clinical advantage on death and admission to hospital in the GISSI-HF trial . Other investigators showed that the survival benefits in patients with chronic CHF treated by rosuvastatin might result from direct anti-arrhythmic properties on ventricular conduction and excitability (both in patients with ischemic and non-ischemic cardiomyopathy) by modulating the fatty acid composition and physiochemical properties of the sarcolemma [22-24]. On the other hand, it was reported that ACE inhibition by enalapril has only minor influence on inflammation in heart failure patients . The present contribution aims at generating a hypothesis, namely that rosuvastatin at a relatively short-term regimen may be useful in the setting of acute CHF with life-threatening arrhythmias. Since normalization of initially highly increased hs-CRP was seen, an anti-inflammatory action might be the common pathophysiological thread in this patient who presented with SCFP during the acute phase. The half life of hs-CRP in circulation is about 24 hours. Its relatively short half-life implies that its serum level should return to the baseline level within two weeks after an acute insult [26,27]. Agouridis et al. observed a 53% reduction of hs-CRP levels in patients with mixed dyslipidemia treated with high dose of rosuvastatin alone . This evidence reinforces our assertion. It should be important to test this hypothesis in a trial. No funding was received for this work and the authors have no conflict of interest to declare. Tambe AA, Demany MA, Zimmerman HA, Mascarenhas E. Angina pectoris and slow flow velocità of dye in coronary arteries – a new angiographic finding Am Heart J 1972; 84: 66-71. Opherk D, Zebe H, Weihe E, et al. Reduced coronary dilatory capacity and ultrastructural changes of the myocardium in patients with angina pectoris but normal coronary arteriograms Circulation 1981; 63: 817-25. Mangieri E, Macchiarelli G, Ciavolella M, et al. Slow coronary flow: clinical and histopathological features in patients with otherwise normal epicardial coronary arteries Cathet Cardiovasc Diagn 1996; 37: 375-81. Beltrame JF, Limaye SB, Wuttke RD, Horowitz JA. Coronary hemodynamic and metabolic studies of the coronary slow flow phenomenon Am Heart J 2003; 146: 84-90. Demirkol MO, Yaymaci B, Mutlu B. Dipyridamole myocardial perfusion single photon emission computed tomography in patients with slow coronary flow Coron Artery Dis 2002; 3: 223-9. Mangieri E, Tanzilli G, De Vincentis G, et al. Slow coronary flow and stress myocardial perfusion imaging.Different patterns in acute patients J Cardiovasc Med 2006; 7: 322-7. Atak R, Turhan H, Sezgin AT, et al. Effect of slow coronary artery flow on QT interval duration and dispersion Ann Noninvasive Electrocardiol 2003; 8: 107-1. Puddu PE, Jouve R, Torresani J, Jouve A. QT interval and primary ventricular fibrillation in acute myocardial infarction Am Heart J 1981; 101: 118-20. Puddu PE, Bourassa MG. Prediction of sudden death from QTc interval prolongation in patients with chronic ischemic heart disease J Electrocardiol 1986; 19: 203-12. Kayikcioglu M, Payzin S, Yavuzgil k, et al. Benefits of statin treatment in cardiac syndrome-X Eur Heart J 2003; 24: 1999-2005. Baller D, Notohamiprodjo G, Gleichmann U, et al. Improvement in coronary flow reserve determined by positron emission tomography after 6 months of cholesterol-lowering therapy in patients with early stages of coronary atherosclerosis Circulation 1999; 99: 2871-5. Kaesemeyer WH, Caldwell RB, Huang J, Caldwell RW. Pravastatin sodium activates endothelial nitric oxide synthase independent of its cholesterol-lowering actions J Am Coll Cardiol 1999; 33: 234-41. Takemoto M, Liao JK. Pleiotropic effects of 3-hydroxy-3-methylglutaryl coenzyme A reductase inhibitors Ateroscler Thromb Vasc Biol 2001; 21: 1712-9. Cakmak M, Tanriverdi H, Cacmak N, Evrengul H, Cetemen S, Kuru O. Simvastatin may improve myocardial perfusion abnormality in slow coronary flow Cardiology 2008; 110: 39-44. Fan Y, Yang SS, Yu JB, et al. Atorvastatin use and coronary flow reserve in patients with coronary slow flow Zhonghua Xin Xue Guan Bing Za Zhi 2010; 38: 143-6. Zhang L, Zhang S, Jiang H, Sun A, Zou Y, Ge J. Effects of statin treatment on cardiac function in patients with chronic heart failure: a meta-analysis of randomized controlled trials Clin Cardiol 2011; 34: 117-23. McMurray JJ, Kjekshus J, Gullestad L, et al. CORONA Study Group. Effects of statin therapy according to plasma high-sensitivity c-reactive protein concentration in the controlled Rosuvastatin Multinational Trial in Heart Failure (CORONA) a retrospective analysis Circulation 2009; 120: 2188-96. Cleland JG, McMurray JJ, Kjekshus J, et al. CORONA Study Group. Plasma concentration of amino-terminal pro-brain natriuretic peptide in chronic heart failure: prediction of cardiovascular events and interaction with the effects of rosuvastatin a report from CORONA (Controlled Rosuvastatin Multinational Trial in Heart Failure). J Am Coll Cardiol 2009; 54: 1850-9. Kjekshus J, Apetrei E, Barrios V, et al. CORONA Group. Rosuvastatin in older patients with systolic heart failure N Engl J Med 2007; 357: 2248-96. Gissi HF, Tavazzi L, Maggioni AP, et al. Investigators Effect of rosuvastatin in patients with chronic heart failure (the GISSI-HF trial): a randomised, double-blind, placebo-controlled trial Lancet 2008; 372: 1231-9. Marchioli R, Levantesi G, Silletta MG. GISSI-HF Investigators.Effect of n-3 polyunsaturated fatty acids and rosuvastatin in patients with heart failure results of the GISSI-HF trial Expert Rev Cardiovasc Ther 2009; 7: 735-48. Vyas AK, Guo H, Moss AJ, et al. MADIT-II Research Group. Re-duction in ventricular tachyarrhythmias with statins in the Multicenter Automatic Defibrillator Implantation Trial (MADIT)-II J Am Coll Cardiol 2006; 47: 769-3. Shanes JG, Minadeo KN, Moret A, Groner M, Tabaie SA. Statin therapy in heart failure prognostic effects and potantial mechanisms Am Heart J 2007; 154: 617-23. Dickinson MG, Ip JH, Olshansky B, et al. SCD-HeFT Investigators.Statin use was associated with reduced mortality in both ischemic and nonischemic cardiomyopathy and in patients with implantable defibrillators: mortality data and mechanistic insights from the Sudden Cardiac Death in Heart Failure Trial (SCD-HeFT) Am Heart J 2007; 153: 573-8. Gullestad L, Aukrust P, Ueland T, et al. Effect of high- versus low-dose angiotensin converting enzyme inhibition on cytokine levels in chronic heart failure J Am Coll Cardiol 1999; 34: 2061-7. Yip HK, Sun CK, Chang LT, Wu CJ. Strong correlation between serum levels of inflammatory mediators and their distribution in infarct-related coronary artery Circ J 2006; 70: 838-45. Yip HK, Hang CL, Fang CY, et al. Level of high-sensitivity c-reactive protein is predictive of 30-day outcomes in patients with acute myocardial infarction undergoing primary coronary intervention Chest 2005; 127: 803-. Agouridis AP, Tsimihodimos V, Filippatos TD, et al. The effects of rosuvastatin alone or in combination with fenofibrate or omega 3 fatty acids on inflammation and oxidative stress in patients with mixed dyslipidemia Expert Opin Pharmacother 2011; 12: 2605-11.